Curious about Jedha and reading about a few of the characters from Rogue One? You’re in luck! A new book, Guardians of the Whills, focusses on Chirrut Îmwe and Baze Malbus in the months leading up to the events in Rogue One. In this book, coming out on Tuesday, we follow these two characters mostly helping out friends of theirs who run an orphanage, along with a secondary story of their involvement with Saw Gerrera and his insurgency. A couple of the great things about this book is that we learn more about Chirrut, Baze, and their relationship, which is great, as well as numerous aspects about Jedha in the months leading up to the events in Rogue One and its deterioration due to the increased Imperial presence. Written by Greg Rucka, this book does a nice job of providing insights into the situations of the characters and the world they inhabit, in the months leading up to a feature film. He did the same thing with Before the Awakening, in which he developed the stories of Finn, Rey (and Jakku), and Poe Dameron, in the days, weeks, and months leading up to The Force Awakens. 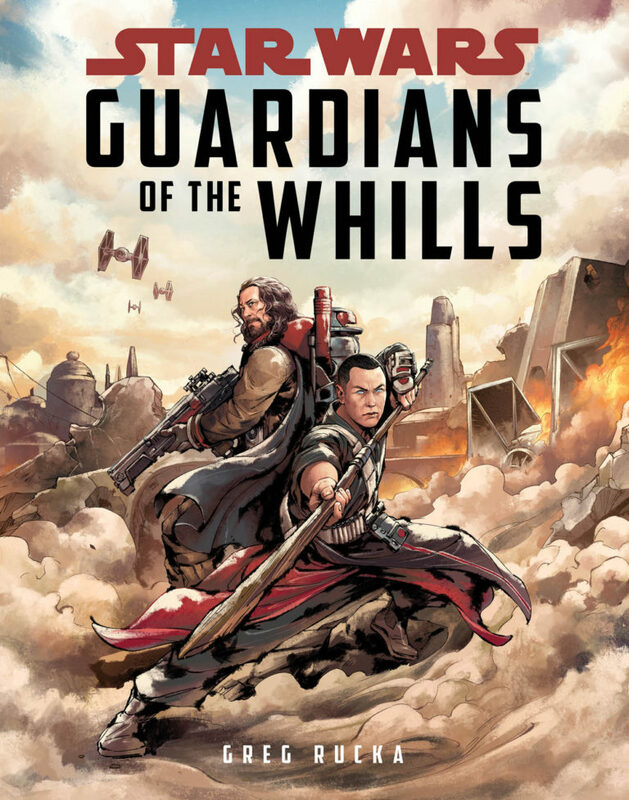 Just as he did with Before the Awakening, Guardians of the Whills is written in a way that could be read by both a younger audience, as well as appreciated by adults. 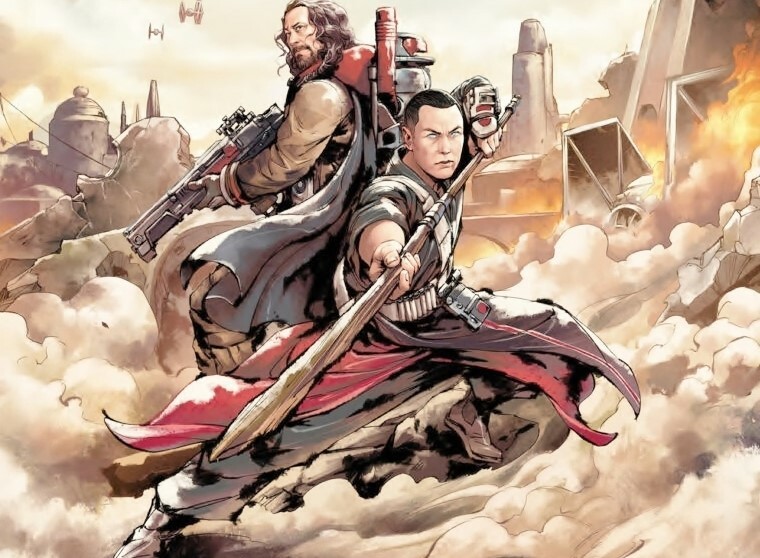 The story regarding the friends of Chirrut and Baze running an orphanage is a primary one, as these two erstwhile guardians of the Whills attack Imperial shipments of goods and pass them along to the needy orphans. 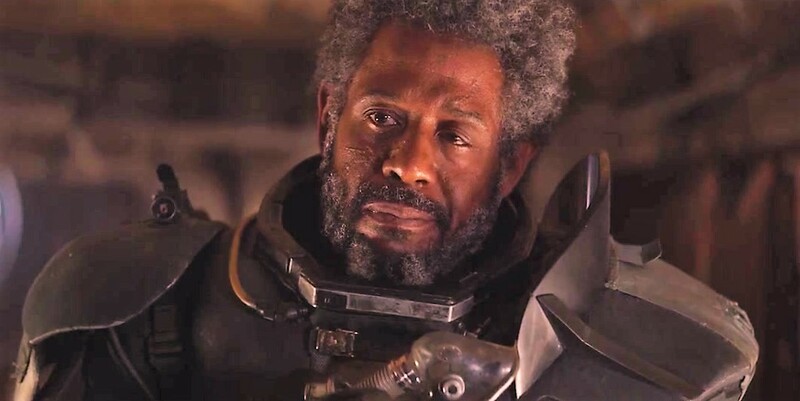 Through these attacks, Baze acquires his Morellian 35c repeating cannon we see in Rogue One (after his E-5 ceases functioning properly), which also catches the attention of Saw Gerrera and his insurgents, who arrive to Jedha. Gerrera’s men make an overture to Chirrut and Baze to help them out, since they know the place and people well, to which the latter assent. Throughout the course of the book, we see these attacks growing, both in quantity, as well as size. However, this seems to backfire, as the Empire increases its presence on Jedha. In fact, the Empire had kept a Star Destroyer in orbit above Jedha, but, with the increasing amount of violence, the Empire moves its ship to be hovering over the city, as we see in Rogue One. On the morning that they do so, they increase Stormtrooper patrols and even send in some TIE fighters. In response to these TIE fighters flying over the city, we read of three of Gerrera’s X-wings engaging in aerial battle with them,* one of which crashed in the Holy City (which may explain why we see a crashed X-wing in the movie on Jedha). And the Imperial occupation only increased after that. Ultimately, however, Baze and Chirrut part ways with Gerrera and his operation (which would explain why they are not given a free pass or special treatment by Saw’s insurgents in Rogue One). It is a pleasant read and provides readers with insights into what transpires on Jedha in the months leading up to Rogue One, as well as providing us with some enjoyable interactions between Chirrut Îmwe and Baze Malbus, as well as learning about the Empire’s takeover of Jedha and the insurgency of Saw Gerrera. 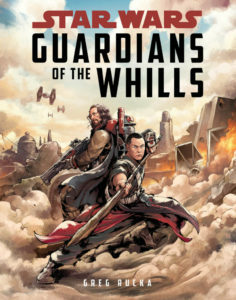 Guardians of the Whills appears on bookshelves on Tuesday, May 2nd. * It seems that this was half of the X-wings that Gerrera’s insurgents possessed, as the Star Wars Rogue One: The Ultimate Visual Guide informs us that “Saw maintains a small squadron of six X-wing fighters dubbed the Cavern Angels, which operates out of the caves near the Cadera catacombs” (86).